Congratulations. We, the parish of Frankfield/Grange, rejoice with you and your family on the birth of your child, and welcome you to the celebration of the Sacrament of Baptism. Baptism is the first step of your child’s journey to God. During the celebration, you will be promising to bring up your child in the knowledge of God as a loving Father. You are making your child part of the wide Christian family, and this is why the link with the parish and the rest of the Church is so important before, during and after the celebration of Baptism. The Parish Baptismal Team has been set up to help you better understand and prepare for this occasion. You are strongly encouraged to attend the preparation meeting they will organize for you, during which the symbolism of the ceremony and any questions you may have will be addressed. These meetings take place in the parish centre on the first Wednesday of each month. The celebration of Baptism can be a wonderful opportunity for you as parents to renew your own commitment to Christ and renew your efforts in the Christian life. Our wish for you is that you may always be examples of inspiration to your child by the way you live your lives. The celebration of the Sacrament of Baptism takes place at 5pm on Saturdays. To book a date for your child’s baptism, contact the Parish Office (one month’s notice is required). 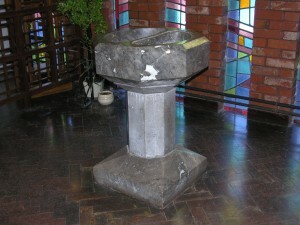 A copy of the child’s original birth certificate is required when booking a baptism. When your child is baptised the details will be registered in the Parish Baptismal Register in the parish office. In the early months of each new year the babies, which were baptised the previous year, together with their families, are invited to a Baptismal Blessing Ceremony. This ceremony is well supported and the congregation is invited for light refreshments in the parish centre directly following the church ceremony. Baptismal certificates can only be requested at the parish office and issued by the parish secretary. There is a RCIA programme (click link and go to bottom of the page) in the parish for adults wishing to join the Catholic Church. Please contact one of the priests of the parish if you wish to avail of this programme.